May I begin by offering my deepest condolence to the family of Taufik Zahar, particularly to his widow Nassida Nasir and his just 2 months old baby. It is sad and it is tragic. It is true that the police shooting was necessary, but it is also true that a family had been broken, dreams shattered and hope vaporized. For Nassida the road ahead suddenly is not going to be what she has been expecting, and now she will have to face a world of divided opinions, let alone facing uncertain years of bringing up the baby alone. She is shocked, she is grieving. Under such emotional trauma, it is never her usual self, so let's not be too hard on what she has just said. Much of what I share here will be about choices, informed choices or otherwise and those that we can choose and those that we cannot choose. Nassida has chosen to marry Taufik and it is not known if she knew about his drug trafficking activities or not. If she had knew of his drug trafficking activities, it becomes part of her choice to accept the obvious consequences whether it will occur or not that imprisonment or death penalty constantly hanging over Taufik's head. Let's just say she was kept in the dark and it is until now that she discovers Taufik has all along been a drug trafficker, the feelings that goes through her right now is unimaginable. Shall she blame Taufik for cheating her but at the same time she loved and missed him? Can she turn around and walk away with baby in hand, away from the dead man who is her husband? There's quite a few choices we can talk about regarding Taufik. First is his choice to become a drug trafficker. This is an informed choice and one making the choice in a certain manner has to accept the conditions that comes with it. Two, he chose to marry someone and had a child with that someone knowing very well that even one in a million chance, there is still a chance that he will put their lives into disarray and pain. This is also an informed choice with definite consequences. Three, he together with the other two has chosen to carry drugs but the amount they carry will only attract a prison term should they be caught and this is also an informed choice. So, Four, why did he chose to go through several stages of barricades knowing well that it will end in a Police Road Block? Five, since the group has made a choice on a safer amount of drug to carry, why then later choose to crash the final block endangering their own lives and others? Could he and the others not have surrendered and it is only jail term? All in all, Taufik has made several choices knowingly. First let me get back some fairness on behalf the police officer who fired the fatal shot. He has not chosen to be the "hero", and for certain he has not chosen to be the one that fired that fatal round. While I still empathized with Nassida's plight and sorrow, I too empathize with the officer who fired that reluctant shot. 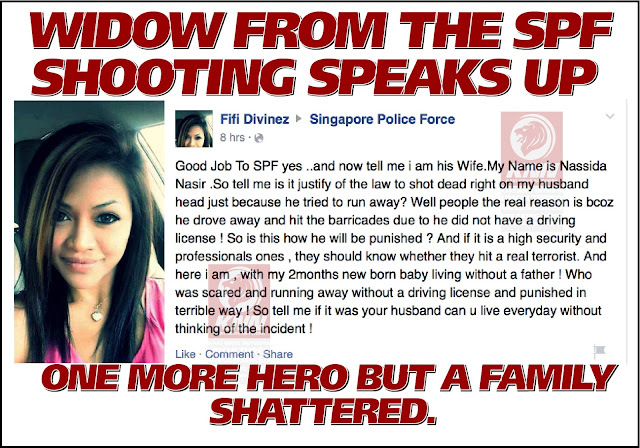 Though it is expected of a police office to use his firearm, SPF never has a trigger happy culture within. The days of exchanging fire were long gone. Yes the police officer has made it his career choice and that choice too come with a certain consequence that one day he may have to open fire to kill someone, but killing someone is definitely not what he has chosen knowingly. And between Taufik and the police officer, it is not their choice that they will meet each other under such circumstances, but the possibility has always existed and it did come true. Yet another claim of fairness here is, Taufik chose to ram the car against police officers manning the post. The same officer may have a young wife waiting at home with a two months old baby in hand. When Taufik chose to drive straight into the officer, it is a circumstance that one of them has to die. Now let me ask.....who should be the one to die? Is it Taufik or the police officer? Who had wanted to kill at the first instance? Was it Taufik or the police officer. Look at the position of the bullet hole on the windscreen and you tell me where was the police officer standing. The police officer will now have to live a life haunted by mental images that he shot dead someone point blank. Yes he did that heroically to save his colleagues lives aw well as his own, but that heroic feeling won't wipe away the memory that someone died in his hand. 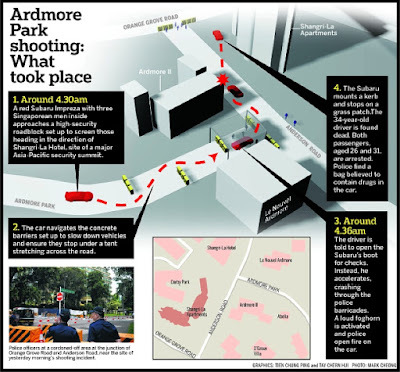 God forbid that Singapore should become a trigger happy nation that killing someone no longer haunts. 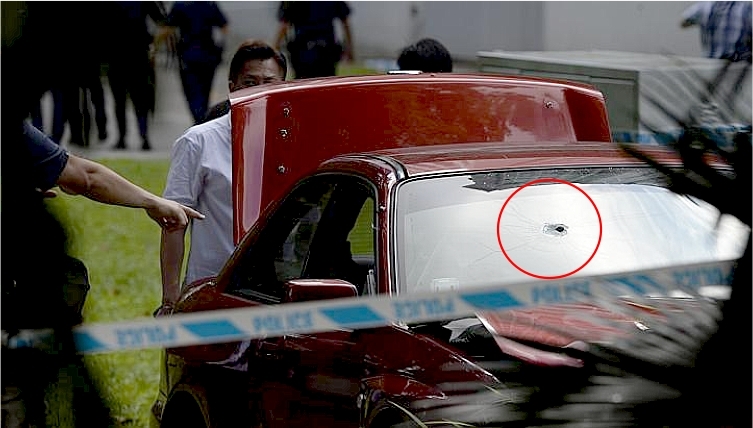 Some has asked, why shoot at the driver and not the car? Let me pose this to those who ask or even want to ask the same question.......do you know at what speed the car was dashing against the officer? Do you know that if that round did not stop the vehicle from ramming forward, someone will die? Do you know that even if the round hit the driver the car can still run over the police officer? Let's be fair to our intelligence and don't make foolish suggestions. Life don't perform along what we wish it is like most of the time. By the way, the police officer is not about to be made a hero as yet. He will still be subject to thorough investigation that the circumstances truly warrants him to fire the shots from his firearm.